Killarney National Park is really stunning and I believe it is a location that should rank highly on everyone's travel bucket list. Impressive Killarney is located in the South-West corner of Ireland. A magical place. Steeped in history and home to some of Ireland's best kept secrets. It is the first national park in Ireland and after visiting several, I actually think it is the best! At around 26,000 acres, thereâ€™s a lot to see and also plenty to do. When visiting this unique natural area, you cannot help but admire the large swaths of the beautiful Irish countryside and the clusters of quaint little villages and historical sites. If you ever visit this park, find out how to get around in this blog. Reaching the national park is easy. I tend to fly to Cork and then travel south westwards by car. I enjoy the driving and love the roads. They are quiet and winding and the driving allows for a multitude of places to be seen and moments embraced. I liked nothing better than slowly driving around at my own leisure and then stopping whenever I felt like it, to revel in the splendid views. There are many places to stop and admire the view and of course take a picture or two. Travelling by 4 wheels is no the only option. Many visitors choose to cycle through the Killarney National Park and revel in its dramatic views. The narrow lanes and stunning scenery make for a pleasurable place to visit and travel around. Especially the spectacular view of Ladies View, which is part of the scenic Ring of Kerry, is worth seeing. 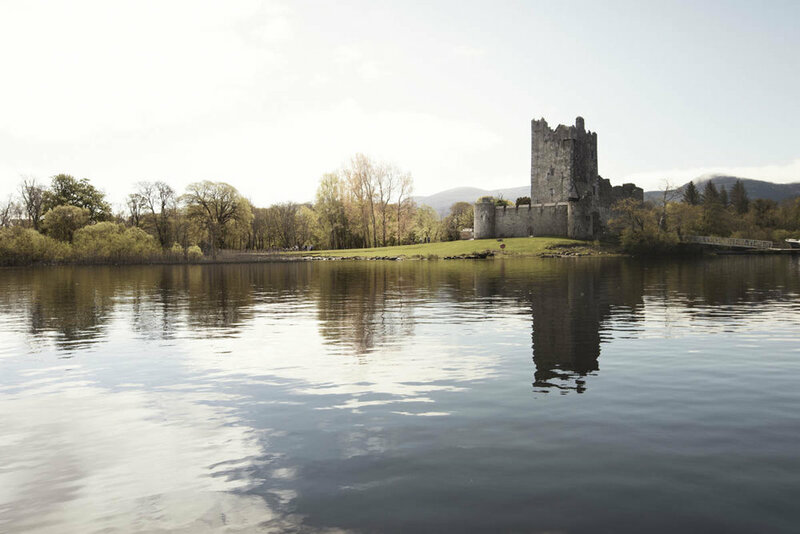 If you choose to cycle, heading towards the majestic Ross Castle can become a great place to visit. As you can freely put yourself (and your bike) onto a boat for a tour of the lake and the castle itself. Allowing you to take in more of the memorable views and stunning scenery, that surround. If you donâ€™t take you bike, then it is easy to rent one here at Cycling Killarney. Taking in the tranquil scenes that surround the castle. Start at Muckross House for this great tour. It lasts for approximately 2 hours and it takes you through a lovely route around the water, to Torc Waterfall, which is spectacular to see. The staff are all really friendly and they will narrate as you go around, telling an interesting story of the landscape and what is there is to do in the city of Killarney too. They pretty much venture out in all types of weather conditions, so it makes for an interesting tour, at various times of the year. The horse tour carriage on the Muckross Estate, also known as the "Jewel of Killarney"
When staying for longer, Hiking is a great way to explore the park. It gives you the ability to see so much more, and go off the path. The park has some stunning landscapes. It might be down to its location, coupled with the range of incredible views, that has led to Killarney to listed as a Biosphere Reserve in 1982 by UNESCO. Collectively, it forms part of the wider Kerry Biosphere Reserve which is all located just south-west of the city of Killarney. The hike trails are all around and vary in degrees of difficulty. They are signposted well and it makes for an interesting way to see the park. Of course, if you want to venture further afield, there are maps and reading guides available to satisfy all needs. If you want an uplifting, breathtaking hike, then put on your walking boots, it certainly is beautiful way to spend an outdoor afternoon or morning. Don't forget to backpack a bottle of water and a snack! The park makes for a picturesque and diverse area, to explore and photograph. Always containing a wide variety of local wildlife and fauna. Admire some of the best views from the boat on the three lakes of the Park: Lough Leane, Muckross Lake (also called Middle Lake) and Upper Lake. They are stunning and of you are like me and love photography, then this is definitely something you should do. There are different ways of getting round by water, but all seem a great experience. You can take to the water and experience the wonderful ambience on a leisure lake tour. Here the boats are covered and cater for tourists. In addition, you can take to a smaller vessel and take a trip in a small motor boat or rowing boat. Whatever takes your fancy! Find more information here. Time to explore in a boat. A unique opportunity to see this great natural park from the quiet and calm waters. The 18th Century Brickeen Bridge with it's single arch, dividing Muckross Peninsula from Brickeen Island. View towardsthe mountains on Lough Leane, meaning "lake of learning". It is the largest of the three lakes of Killarney. My trip was really fantastic and it was of course really wonderful to be back in Ireland once more. I had a great time and yet again had the opportunity to visit so many memorable places. I really do recommend visiting this beautiful corner of Ireland. There is plenty to see and do and any trip will certainly make you want to come back for more. For more information and possibilties to visit Ireland, I suggest you take a look at the website of The Irish Tourist Board. They have a wealth of information for you to discover and make the most of your next visit. I would like to extend a big thanks to Tourism Ireland, for allowing my visit to take place. If you would like to find out more about the park, visit Killarney National Park.